Two reviews! Two! I’m giving you two reviews for the price of one. Now you just can’t beat that kind of a deal. When creative people have children, it has a tendency to affect their work in some way. In worst case scenarios you’ll have celebrities of the Madonna-like persuasion churning out picture books like there’s no tomorrow. Politicians in turn may take time off to “spend more time with their family” (which sounds good even when it isn’t true). But what happens to those people already working in the realm of children’s entertainment? How are they changed by the experience? Take as you example, Mo Willems. Here’s a fellow who was working with Sesame Street and Nickelodeon long before dipping a dainty toe into the waters of children’s book publishing. He does so, along comes his daughter, and Mr. Willems starts changing the kind of work he does. He creates deeply personal picture books like, “Knuffle Bunny” that go on to win Caldecott Honors. He performs with his daughter in a Weston Woods video. And then, most striking of all, he decides to create a book series that his child would be able to read to him. Easy reader books are, to my mind, perhaps the most difficult books to write. It takes a genius like Dr. Seuss or P.D. Eastman to convey concepts and stories with simple words. How much harder would it have to be then to make such a book not only fun to read and easy to understand but also laugh-out-loud funny? Only author Mo Willems knows for sure. 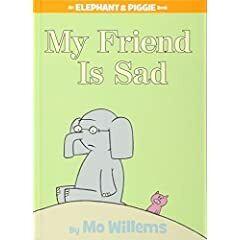 Fortunately for us, the Elephant and Piggie books, “My Friend Is Sad,” and “Today I Will Fly!” are entities that stand entirely of their own. If you've never seen funny easy reading, these will soon solve that woe. “My Friend Is Sad”, is a straightforward little story. Gerald the elephant is mighty depressed and Piggie feels that it is her duty to cheer him up. First she appears before him as a cowboy, knowing how fond he is of them. Gerald is thrilled, then immediately sad. Next Piggie is a clown, but Gerald is STILL sad. When even a time-stepping robot won’t cheer him up, Piggie goes to apologize to her friend for being unable to make him happy. Gerald explains that he is overjoyed now because Piggie is near, but that earlier he was quite unhappy when he saw a cowboy, a clown, and “a cool cool robot,” and couldn’t share these things with Piggie because she wasn’t around. Reconciled the two sit contently, and Gerald remarks that he needs his friends. Piggie can’t help but reply to the reader, “You need new glasses . . .” and all is well. 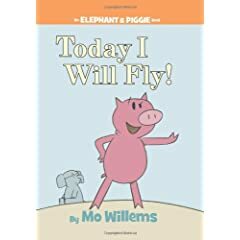 In the second book, “Today I Will Fly”, Piggie is intent on one thing. Flight. Gerald remains incredulous, but his porcine companion is not to be deterred. Hopping doesn’t help and a fine leap away from a vicious dog only means that she jumps particularly well. Soon a solution is found involving a helpful pelican. Impressed, Gerald comments that perhaps tomorrow he will fly as well. “Good luck’, murmurs Piggie with a wink. I won’t lie to you. I’m a twenty-eight-year-old woman and I’ve been reading these books over and over since I laid my hands on them. I can’t explain it. “My Friend Is Sad”, in particular tickles my fancy. I have a hard time not snickering every time Gerald explains to Piggie why it is that the cowboy he saw made him sad. “But you love cowboys!”, explains Piggie, confused. Gerald smiles and says wistfully, “I do. I love cowboys.” Next thing you know he’s grabbed Piggie by the labels and screams while shaking, “But you were not there to see him!” This cracks me up. Gerald’s despair is so melodramatic and self-absorbed that when he shouts his sorrow over the “funny funny clown” (his knees have buckled by this point, his head thrown back) Piggie can't help but stare at the viewer with the skeptical half-mast expression of someone who feels that she is having her leg pulled. I’ve just gone through and counted at least sixteen different positions Gerald puts himself through so as to convey to the viewer his complete and utter wretchedness. Sixteen, folks. In an early reader. That's class. Look, I’m not saying that I didn’t have any respect for Mr. Willems before this book. “Don’t Let the Pigeon Drive the Bus”, is obviously an exercise in letting a simple drawing speak for itself. But the Elephant and Piggie books require an entirely different set of muscles and for that my admiration has shot up. Simple images are one thing. Simple words are another. Take “Today I Will Fly!” as your example. Like “My Friend Is Sad”, it starts off with a single premise, becomes rapidly absurd, solves the problem (with one character staring incredulously at the other), and ends on a sly joke (curiously by the same person both times). And in both cases Piggie is trying to do something and failing. Interestingly enough, Gerald is the skeptic in the book where his good friend tries to defy gravity again and again. When Piggie comes around to agreeing that a mighty leap does not constitute flight, she declares resolutely, “I will try again!” Gerald looks particularly unconvinced as he exits stage right saying, “I will eat lunch,” and an overly enthused Piggie waves, “Good-bye!”. Comedy. You dissect it and it’s not funny anymore. So I can’t really say how it is that Willems found a way to make stories this straightforward as amusing as they are. That he did is enough for me. What we may have on our hands here are the makings of an entirely new franchise. Think about the shocking popularity of critters like “The Cat and the Hat”, for example. I don’t want to suggest that someday there will be a filmed version of Elephant and Piggie starring someone like Mike Myers, but stranger things could happen. So before the hype and the overkill set in, take some time to discover this charming twosome on your own. These books may be one of those rare creations that turn the tables so that it is the adults who will be begging their children to read them an Elephant and Piggie book again and again and again. Another hit out of the park for the Willems man. On shelves April 1, 2007. Of course, I had no doubt the books would be great. Can't believe you scooped me with Mo news. Only because I was at ALA Midwinter and happened to stumble onto the Hyperion table. Otherwise this piece of Mo-trivia would be all yours. I don't buy many picture books (because since this is my second picture-book reader, I feel like I am overrun with them from child number one, for whom I bought many many books). However, I think that I will preorder these now. Thanks for the great review. I love books that my kids and I can both enjoy. It sounds like 2 year old son and 8 year old daughter would appreciate these. These look adorable, of course. Why is Gerald sad in the first place? Pardon me if I missed that in the review.These look adorable, of course. Why is Gerald sad in the first place? Pardon me if I missed that in the review. Gerald is sad because Piggie is not around. This is never explicitly stated, but you get the general gist when you learn what it was that made him increasingly morose. Cor blimey, look at all me big words!